When it comes to your wedding there's so much to arrange from the flowers, to the caterers and not forgetting the dress! And deciding on whether or not to have a make-up artist and which one to choose isn't easy either but here are a few helpful tips. Booking a make-up artist for your wedding is a good idea as it takes away the pressure of you having to do your own make-up on your big day. There will be so much else to organise and manage so if you can delegate this task to someone else why not; after all nerves will probably get the better of you anyway. By booking a make-up artist you can relax and let someone else pamper you and make you look stunning for your special day. Also good make-up artists always have a make-up kit that caters for weddings, make-up that will last, be able to withstand the hot camera lights and that will give you that gorgeous glowy flawless skin. A make-up artist's kit will also have a variety of make-up so you will be able to achieve the desired look and as all eyes will be on you why not complete the whole look and get a professional to do your make-up. It's a good idea to do your research before you book your make-up artist; asking to look at their portfolio or samples of other brides they have done is a good way for you to see if you like their style of make-up and if it's for you. Also a professional make-up artist will have to skill of contouring and highlighting (applying dark & light shadows using make-up to complement your features) so they can give the impression of you having higher cheekbones or a thinner nose. Try to get a few quotes from different make-up artists so you can decided which one best suits you depending on your budget. Try and book one close to where you will be getting ready so you don't have to worry about them travelling too far to do your make-up on the actual day- having your make-up artist stuck in a traffic jam and on the other side of the city is the last thing you want to be worrying about. Once you have booked your make-up artist, go through magazine pictures of your desired look for the day and show them to the artist so you are both clear on the make-up for the day. It is a good idea to have a trial with your make-up artist running up to the big day so you can make any adjustments to the look and to ensure you will be happy with the results on the big day. It's also a chance for you to see how your skin is after the make-up application as although good make-up artists use the top quality cosmetics if your skin is sensitive it is highly recommended that you have a trial. Some make-up artist charge for the trial separately and some include it in the wedding package they offer. Once your happy with your chosen make-up artist just relax and enjoy the time running up to the wedding day and let a professional give you that special touch. To give your skin that natural dewy glow it's a good idea to have weekly facials running up to your wedding- ideally 6-8 weeks beforehand. Good Make-up artists are in high demand so you need to book at least 6 months in advance of your big day. When you have your make-up trial it's a good idea to take a friend along with you for a second opinion. 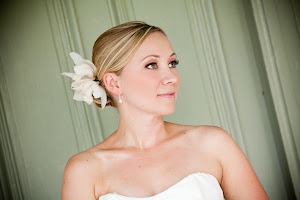 Ask your make-up artist about group package deals for your bridesmaids this often works out to be quite cost effective. If you are going for more of a glam look remember to ask your make-up artist about false eyelashes.